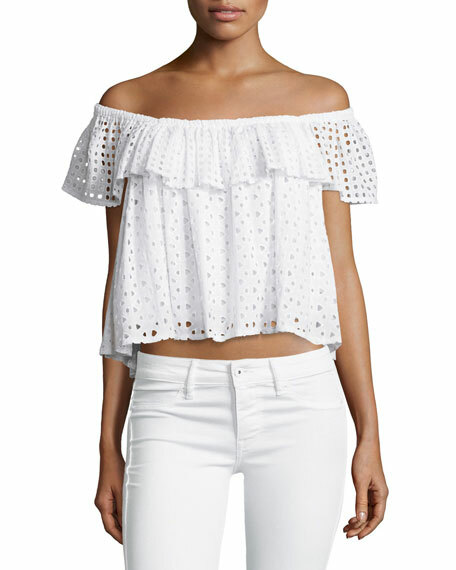 Rebecca Minkoff "Celestine" top with eyelet detail. Approx. measurements: 15"L shoulder to hem, 16.5"L down center front, 17"L center back to hem. Cape detail at chest and shoulders. Model's measurements: Height 5'8.5"/174cm, bust 32"/81cm, waist 23"/58cm, hips 35"/89cm, dress size US 2. For in-store inquiries, use sku #1521205.